Office Hours: Thu and Fri 2-3:30 pm, Additional hours by appt. Digital Course Packet – Scroll down to the class schedule. Download items there. In this advanced course on inter-cultural, religious, and political relations, we will explore and discuss the intensive interaction of Jewish, Islamic, and Christian communities during the medieval and early modern periods. Together, we will: witness an Islamic caliph’s gift of an elephant to a Christian king, follow the flow of silk and sugar across the Mediterranean Sea, watch a Jewish general lead an Islamic army into battle, lament the tragic outcome of the “curious” medicine of the Franks, experience the three faiths’ rediscovery of Greek philosophy and science, and bear witness to the tragedies of religious intolerance. This course focuses on what the great Spanish historian Americo Castro referred to as “convivencia”, the co-existence of medieval and early modern Jews, Christians, and Muslims. Our exploration begins with an investigation of the simultaneous development and formation of medieval European and Islamic civilizations (600-1200). After acquiring this essential historical context, we will begin the critical process of exploring two key and counter-balancing Competitive Landscapes—in the west, the Iberian Peninsula and North Africa, and in the east, the Holy Land and Byzantium. By studying these two Competitive Landscapes, we will acquire an analytical framework that will prepare us for investigating five dominant Spheres of Contact in the greater Mediterranean. These include: Egypt, Iberia and North Africa, the Holy Land and Byzantium, Sicily and the central Mediterranean, and Constantinople/Ottoman Turkey. The investigation of each Sphere of Contact will allow us to understand the manner in which these social groups interacted as well as assess their views of each other. We will study religious and cultural beliefs, economics and trade, political events and warfare, language and the arts, and intellectual and scientific issues. In sum, the course will highlight the numerous interconnectivities of the medieval Mediterranean world. Attend all course lectures and read the assigned materials. Class attendance is mandatory. Two or more unexcused absences are grounds for an automatically failure in the course. Always attempt to contact me via email if you will be missing class. Acquire a solid knowledge of the history of the medieval Mediterranean world and garner an appreciation of the three primary faith groups living within it. Thoughtfully consider a limited selection of the course’s readings and lectures and present your findings in concise, well-written essays. Actively engage with a historical period by re-enacting the goals and aspirations of a historical personage. To accomplish this, we will use Reacting to the Past’s The Second Crusade. During this course segment, you will assume a historical role to re-enact that requires you to prepare a host of short writing assignments (1-3 pages), give multiple oral presentations, and actively participate in class. Two-thirds of you’re the Second Crusade grade will be based on your writing assignments (three papers, all submitted in-class) and one-third of your grade on class-participation. The “Reacting to the Past” pedagogy, initially developed at Barnard College, seeks to introduce students to significant historical ideas and texts. It uses a “role playing” format to replicate the historical context in which these ideas acquired significance. Guide other students’ learning and acquisition of knowledge. You will be responsible for presenting a reading selection and for facilitating one class discussion. Each student will be responsible for (1) delivering a ten to fifteen minute presentation on their reading selection’s content and arguments and (2) providing informative class handouts on the readings. Writing Resources for Students — Check it out! Note: As of February 23, 2015, the second essay on Defining Boundaries in al-Andalus was changed to an optional assignment that is now due on March 20, 2015. All students have either the option of (1) submitting this paper for full credit on March 20th for 15% of their grade or (2) not submitting this assignment having all of their other assignments increased in weight by 3% of the total grade. Conceptualize the varied cultural, political, intellectual, and economic interconnections that linked the Mediterranean during the Middle Ages. 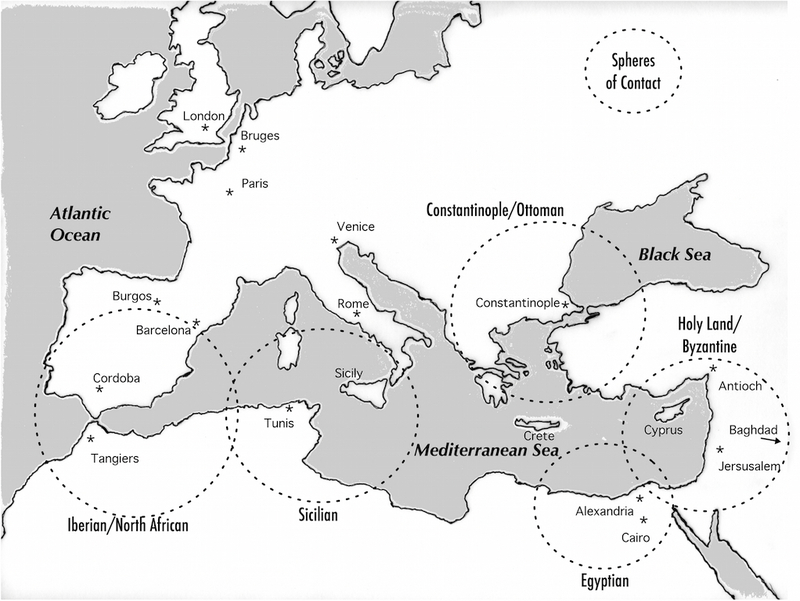 Understand the similarities & differences of the Spheres of Contact in the medieval Mediterranean. Appreciate the nature of cultural and religious co-existence of Christians, Muslims, and Jews. Visualize the limits of cultural and religious accommodation in the medieval Mediterranean world. Picture medieval Europeans’ and “other’s” perceptions of each other. Metcalfe, Alex. 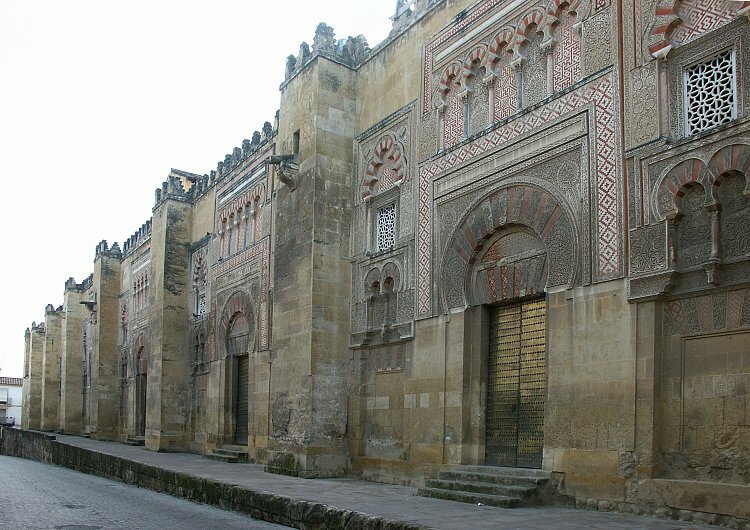 Muslims and Christians in Norman Sicily: Arabic speakers and the end of Islam. New York: Routledge, 2003. ISBN: 978-0-415-61664-7. 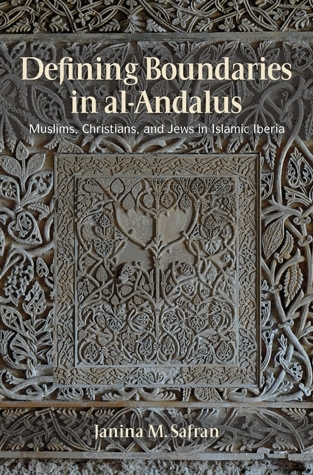 Safran, Janina M. Defining Boundaries in al-Andalus: Muslims, Christians, and Jews in Islamic Iberia. Ithaca: Cornell University Press, 2013. ISBN: 978-0-8014-5183-6. Rustow, Marina. 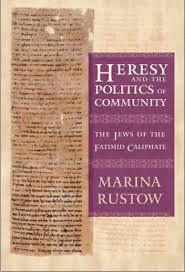 Heresy and the Politics of Community: The Jews of the Fatimid Caliphate. Ithaca: Cornell University Press, 2008. ISBN: 978-0-8014-4582-8. Course readings available on Dr. Martinez-Davila’s Website (http://bit.ly/1wrip5v). You can download all extra course readings from the website. Reacting to the Past: The War Council of Acre. Download: SecondCrusade_StudentManual Pages 1-56. Reacting to Past: The War Council of Acre. Review of the syllabus, course requirements and assignments, required texts and readings, and class schedule. Brubaker, Leslie. “The Elephant and the Ark: Cultural and Material Interchange across the Mediterranean in the Eighth and Ninth Centuries.” Dumbarton Oaks Papers, Vol. 58. (2004), pp. 175-195. Download Brubaker. Goitein, S.D. “The Unity of the Mediterranean World in the ‘Middle’ Middle Ages.” Studia Islamica, No. 12. (1960), pp. 29-42. Download Goitein. Alexander, Paul J. “Religious Persecution and Resistance in the Byzantine Empire of the Eighth and Ninth Centuries: Methods and Justifications.” Speculum, Vol. 52, No. 2. (Apr., 1977), pp. 238-264. Download Alexander. Makdisi, George. “The Scholastic Method in Medieval Education: An Inquiry into Its Origins in Law and Theology.” Speculum, Vol. 49, No. 4. (Oct., 1974), pp. 640-661. Download Makdisi. Galloway, J. H. “The Mediterranean Sugar Industry.” Geographical Review, Vol. 67, No. 2. (Apr., 1977), pp. 177-194. Download Galloway. A Short History of the Middle Ages, Chapter 2: The Emergence of Sibling Cultures. Download Rosenwein. Worldmark Encyclopedia of Religious Practices. S.v. “Islam,” by John L. Esposito. (pp. 349-379). Download Esposito. Squatriti, Paolo. 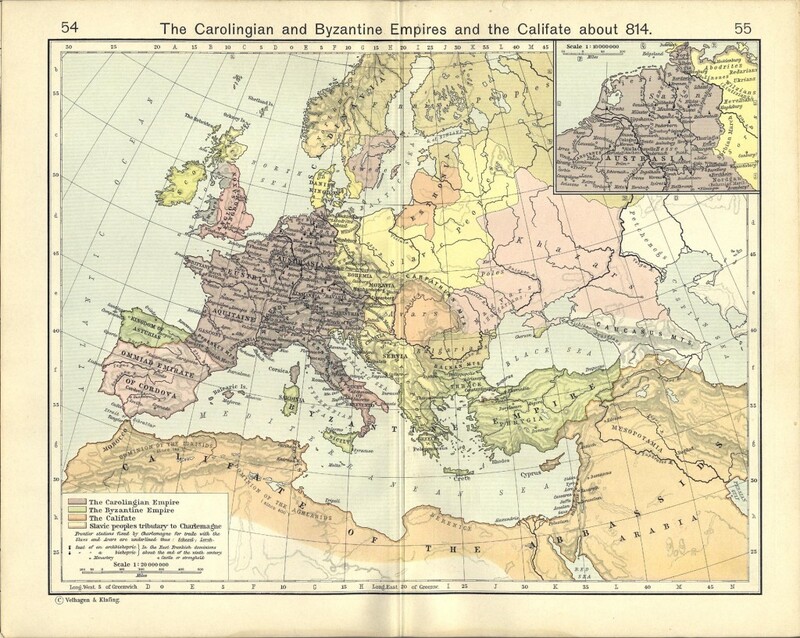 “Mohammed, the early medieval Mediterranean, and Charlemagne.” Early Medieval Europe 11 (2002), pp. 263-79. Download Squatriti. Jacoby, David. “Silk Economics and Cross-Cultural Artistic Interaction: Byzantium, the Muslim World, and the Christian West.” Dumbarton Oaks Papers, Vol. 58. (2004), pp. 197-240. Download Jacoby. Muhammad’s Constitution of Medina. Download Constitution of Medina. The Islamic Pact of Umar. 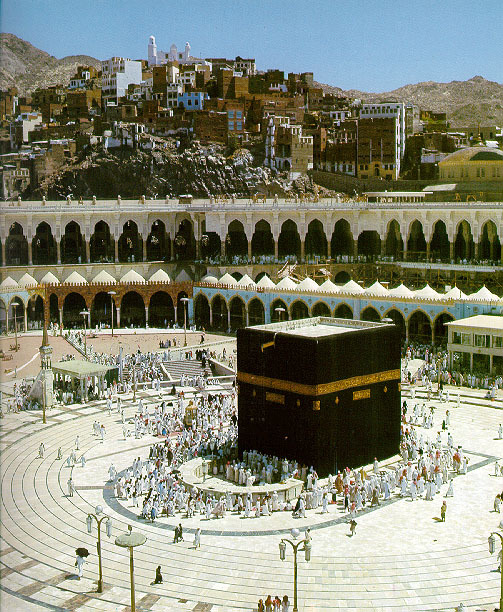 Download The Pact of Umar – 7th Century. Spanish Christian King Alfonso X “The Wise” and the Las Siete Partidas (Seven Part Law Code). Download Las Siete Partidas. Review: Writing Resources for Students — Check it out! Submit 1st Comparative Essay on Lectures/Readings in class. For Class: We will continue with our discussion of the articles by P. Squatriti and D. Jacoby. Afterward, we will watch a short video introduction on Islamic Spain and then discuss Chpt. 1. We will delay discussing Chpt. 2 until next week. Due to snow and bad weather conditions — class is cancelled for February 27, 2015. Reacting to the Past “The Second Crusade” – Game Session 1: Introductory discussion about the Second Crusade game and the historical moment of 1148. Gamemaster lectures and leads class discussion about the game and the historical background to the Second Crusade. Roles distributed. Session agenda: Gamemaster leads discussion about the major texts regarding just war. Faction meetings. Asbridge, T.S. “The ‘Crusader’ Community at Antioch: The Impact of Interaction with Byzantium and Islam.” Transactions of the Royal Historical Society, 6th Ser., Vol. 9. (1999), pp. 305-325. Download Asbridge. Game Session 1: Read the game rules in the student game book, The Second Crusade: the War Council of Acre, 1148, pp. 1-56. Student Manual for The Second Crusade: the War Council of Acre, 1148. Dowload Second Crusade Student Manual. Firestone, Reuven. “Conceptions of Holy War in Biblical and Qur’ānic Tradition.” The Journal of Religious Ethics. Vol. 24, No. 1 (Spring, 1996), pp. 99-123. Download Firestone. Augustine’s City of God, especially Bk. 19. Go to the Catholic Encyclopedia’s Version of Book 19. Selections from An Arab-Syrian Gentleman and Warrior in the Period of the Crusades: Memoirs of Usamah ibn-Munqidh. Usmah Ibn Munqidh (1095-1188): Autobiography, excerpts on the Franks. 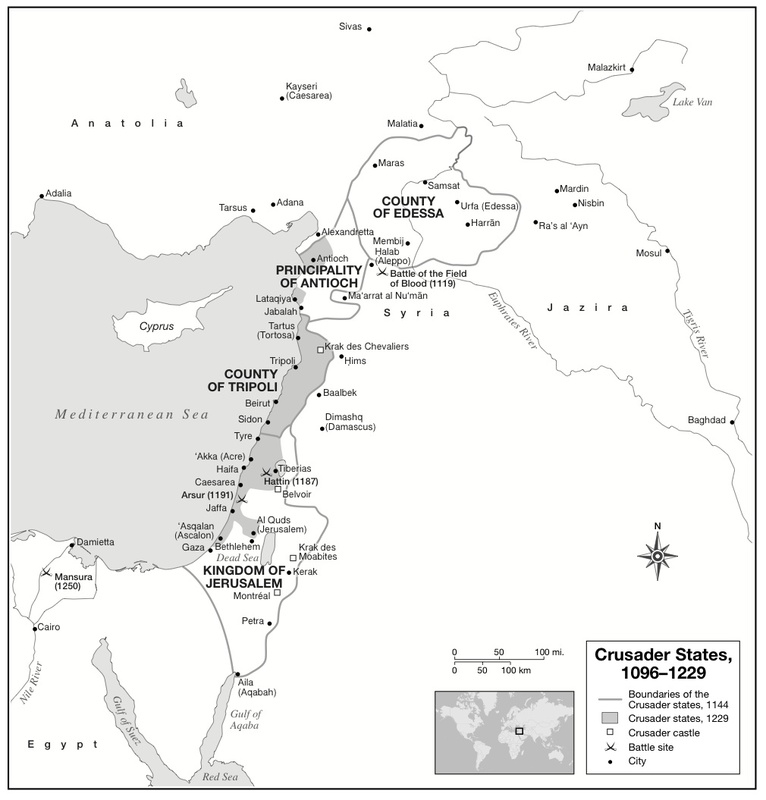 Reacting to the Past: The Second Crusade: The War Council of Acre, 1148 c.e. Session agenda: Gamemaster leads discussion about the historical documents, especially the Investiture Controversy, and sources for the First and Second Crusades. Faction meetings. Indeterminates meet with GM to get their “game plan” approved. Factions Will Complete a Quiz for Extra Relic Points. Read excerpts from Fulcher of Chartres, Pope Eugenius III’s crusading bull, St. Bernard of Clairvaux’s, “In Praise of the New Knighthood,” Usamah ibn Munqidh, Ibn al-Qalanisi, Otto of Freising and Odo of Deuil’s in Appendix B. Complete Student Manual for The Second Crusade: the War Council of Acre, 1148. Dowload Second Crusade Student Manual. Session agenda: Students will debate questions surrounding just war and crusading. Reread excerpts from the sources and prepare arguments for Debate 1. Session meeting: Second Council session: “What is Crusading?” cont. Session agenda: Debate 1, continues. Vote is held on whether or not a crusade will take place. Reacting to the Past Paper 1 Due In-Class. Documents from the Investiture Controversy. Complete Student Manual for The Second Crusade: the War Council of Acre, 1148. Download Second Crusade Student Manual. Session agenda: Students will begin to discuss who should lead the crusade in order to ensure its victory. Nominations will be made and candidates will describe their qualifications. Council will decide on a specific list of issues that will become probative questions to ask the candidates during the next session. Session meeting: Fourth Council session. Session agenda: “Roundtable Discussion” of the issues decided upon during the previous session. Each candidate will take turns addressing the questions at hand. Non-candidates will each have an opportunity to direct questions for debate at particular candidates or at the candidates in general. A vote will be held and a candidate selected to be leader of the crusade. Election is held for a leader of the crusade by secret ballot. Winner declared leader of the crusade. Excerpts from: William of Tyre, Otto of Freising, and Odo of Deuil in Appendix B. Reacting to the Past Paper 2 Due In-Class. Session agenda: Students will debate the pros and cons of attacking each city, including: the possibility of breaking the truce with Damascus, the potential expansion southwards of the Latin Kingdom, and the benefits of restoring the pre-1144 status quo. Students will return to excerpts from Usamah ibn Munqidh, Ibn al-Qalanisi, William of Tyre, and Otto of Freising in Appendix B. Session meeting: Sixth Council meeting: Final debating session. Session agenda: Students will decide where to attack and the Indeterminates will decide which faction they want to support. Vote is held on geographical target. Gamemaster determines success of the crusade; Victory points tallied; winning factions declared. Reacting to the Past Paper 3 Due In-Class. 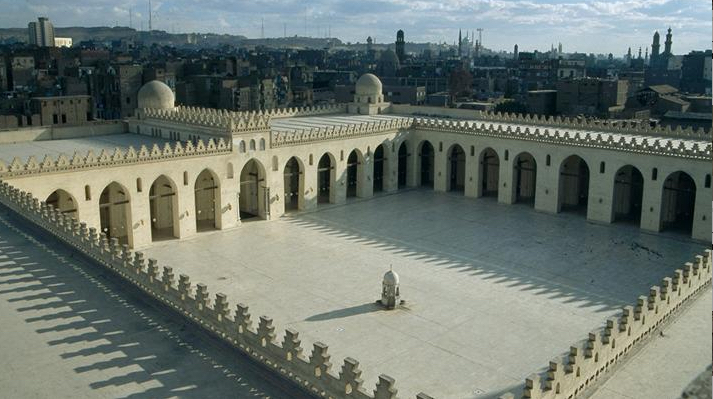 Mosque of al-Hakim (Cairo, Egypt) 990-1013 c.e. Includes: Introduction (pp. xv-xxxiv), 1: The Triparte Community (pp. 2-35), 2. 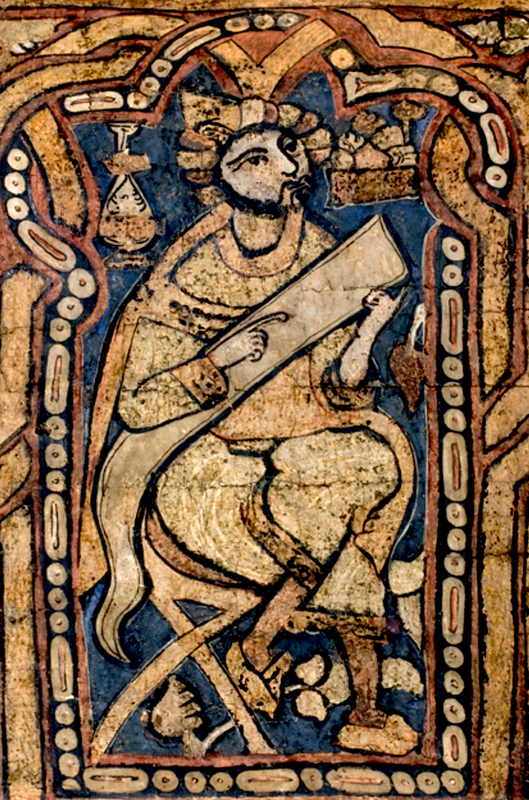 Jewish Book Culture in the Tenth Century (pp. 36-66). Discussion Leader for 1: The Triparte Community (pp. 2-35): Aaron Lucore. Goitein, S.D. “The Documents of the Cairo Geniza as a Source for Mediterranean Social History.” Journal of the American Oriental Society, Vol. 80, No. 2. (Apr. – Jun., 1960), pp. 91-100. Download Goitein #2. Submit your 3rd Essay on Heresy and the Politics of Community in class. Includes: 5. “Nothing But Kindness, Benefit and Loyalty” (pp. 134-155), 8. The Affair of the Ban on Excommunication in 1029 (pp. 200-238). Creator Probably southern Italy or Sicily Culture European; Southern European; Italian Title Casket Work Type Decorative Arts and Utilitarian Objects Date 11th-12th century Material Ivory Measurements L. 15 in. (38.1 cm), W. 8 in. 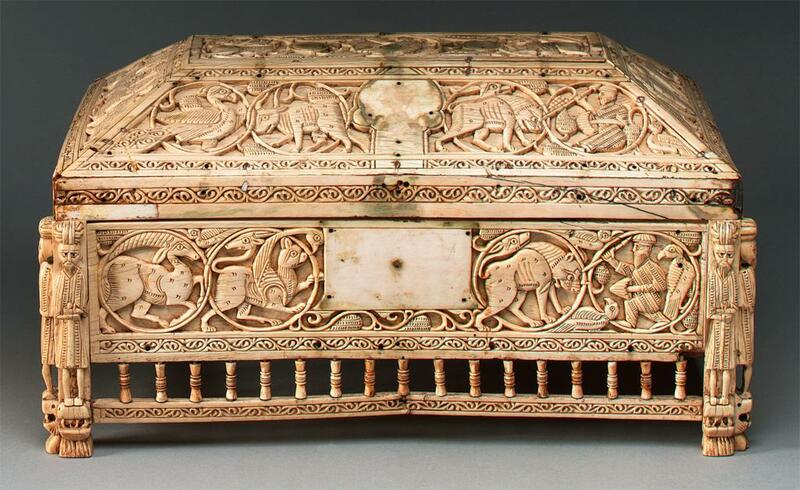 (20.3 cm) Description This box, known as the Morgan casket, is one of the most accomplished Islamic works of art in ivory. Even though it was probably produced in southern Italy, the animals enclosed in the interlacing vine are similar in style and iconography to contemporaneous Fatimid art from Egypt. Sicily was under Muslim rule for almost three centuries, which explains the Islamic influence on the works produced there in medieval times. Includes: Introduction (pp. xv-xvii), 1: Sicily before 1100 (pp. 1-29), 3. “Normans”… (pp. 55-70), 5. Communication around the royal palaces and Arabic as a language of the ruling elite (pp. 99-113). Discussion Leader for 5. Communication…(pp. 99-113): Noel Jenkins. Abulafia, David. “The Crown and the Economy under Roger II and His Successors.” Dumbarton Oaks Papers, Vol. 37. (1983), pp. 1-14. Download Abulafia. 1st Discussion of Issues: Discuss Chapter 7. 2nd Discussion of Issues: Discuss Chapter 8. Includes: 7. Arabic into Latin (pp. 127-140) and 8. Arabic into Greek (pp. 141-173).